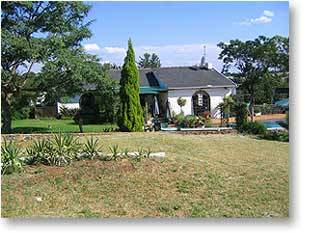 Amaqele Bed & Breakfast offers a country experience close to the city on a 7-acre estate. Amaqele is situated north of Johannesburg, in Chartwell, a lovely tranquil country area. Amaqele is a few minutes from Fourways, Lanseria Airport, Randburg and Kyalami, Sunninghill and other major centres. Relax in the landscaped garden, revive your spirits at the serene water feature, or plunge into the sparkling pool after an exhausting day. For the more sporty, horse rides can be arranged in the vicinity. We offer 3 standard rooms (one with kitchenette), each with its own TV. All rooms are individually decorated, spacious and comfortable with bar fridge, tea and coffee facility, hairdryer, and all other bathroom amenities. Smokers and non-smokers are catered for. Amaqele offers secure under-cover parking, laundry facilities, lounge with fireplace and bar. For the business traveller, there are internet, fax and printer facilities at your disposal. Choose to have either the 'hearty', or 'continental' breakfast in the dining room, or on the patio overlooking the hills of the northern suburbs. Snacks and/or dinner by arrangement. For the adventurous with time on their hands, trips can easily be organised by reliable third parties: Rhinopark, Lion Park, Magaliesberg, Sun City, Pilanesberg National Park, etc., or do your own thing using our customised maps. For trips to the coast, Kruger National Park, or any other South African destination, consult the management and staff for reliable route planning and booking. At Amaqele we strive to cater for your every need in a relaxed and caring atmosphere.